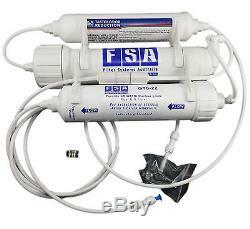 Portable AQUARIUM Reverse Osmosis WATER FILTER With DI Resin. Suits Both Fresh and Salt Water Aquariums. Zero' TDS Filter - 100% Pure. Laboratory Nuclear Grade De-Ionising Resin. Connects to Standard Kitchen Taps. Yes, there are cheaper systems on the market to produce DI quality water for your aquarium. However when you look closely at these systems you will note the following. Small DI canisters which hold very little DI resin, Di resin expires fairly quickly particularly on high TDS water like Perth, Adelaide and Brisbane. The higher the TDS the higher the residual percentage of TDS left by the RO. The higher the residual, the harder the DI works, and quicker it expires. Our system holds 350gm of nuclear grade Purolite resin the best in the world. Most other system are only offering less than 200 grams. NOTE: The diverter valve supplied with this unit suits MOST common standard kitchen taps. If you have a tap with a thread of less than 22mm it WILL NOT fit. HOWEVER, if this is the case we have an alternate fitting we can supply you which allows it to be connected to an outdoor 3/4" thread OR the Laundry water inlet (3/4") this is usually the most preferred method of using this system. Stage 1: 1 Micron Inline Carbon Filter - 6 months. Stage 2: 50GPD Asprinn Membrane - up to 4 years. Stage 3: DI Resin Refill Bag - 6-12 Months. In cases where a PO box, Parcel locker or any other Australia Post Service is provided, we will have to use Australia Post who have a wider range of parcel restrictions. Filter Systems Australia enforces strict dispatch protocols to avoid human error where possible. Orders are thoroughly checked and signed off, carefully packed to minimise chance of transit damage then recorded manually into a hard copy dispatch manifest. All orders MUST be checked for damage within 48 hours of being signed for as delivered (based on tracking details). Please note that the above estimates are taken directly from Australia Posts Business Customer Information. If you require your item ASAP this is something you should select. Only provide an ATL on orders when there is a safe place for items to be left. Any damage caused during or as a result of transit will not be the responsibility of FSA. The date and by whom the product was installed. The location where the product was installed. The date and time the product first appeared to malfunction. The nature of the problem with the product. The date and time of any and all loss event/s. The date and time Filter Systems Australia was first notified of the product malfunction. Product damage results from water hammer, freezing, neglect or is not installed by a licensed plumber in accordance with the installation plan. The water temperature exceeds 38° Celsius. The system is not installed with an Australian Standards approved Pressure Limiting and Dual Check Valve. Join now to receive latest updates & exclusive offers from Filter Systems Australia. The item "Portable AQUARIUM Reverse Osmosis WATER FILTER With DI Resin. 0 TDS (1-70DI)" is in sale since Friday, March 7, 2014. This item is in the category "Home Appliances\Small Kitchen Appliances\Water Purification\Water Filters". 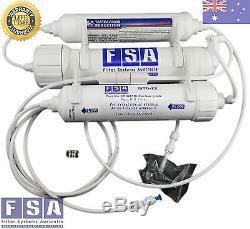 The seller is "filtersystemsaustraliafsa" and is located in Gold Coast, QLD. This item can be shipped worldwide.